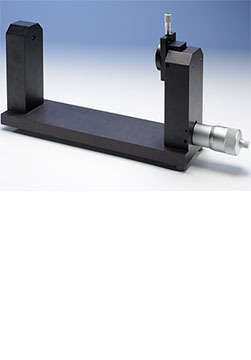 Calibration fixture for the L-700 Laser and T-261 4-Axis Target. Allows the calibration of the V & H center values and the V & H angular values using cal-lab-certified micrometers and HLI software. Can also be used to set the laser beam to the middle if it’s adjustment range prior to starting an alignment job. Used with the S-1380 Read8, S-1390 Spindle8 and S-1410 R-1307 Calibration software programs.